Last winter, we featured an international teaser trailer for the animated adaptation of the classic 1943 tale The Little Prince. The film hails from France as the most expensive animated feature every produced in the country ($80 million), and the combination of wonderful 3D computer animation and beautiful stop-motion animation makes for quite the magical pairing for this story of a curious, magical prince and his interplanetary adventures. In this version (dubbed with English), the story is framed by an aviator narrator (Jeff Bridges) telling the prince's tale to his neighbor's busy little girl (Mackenzie Foy). Watch! 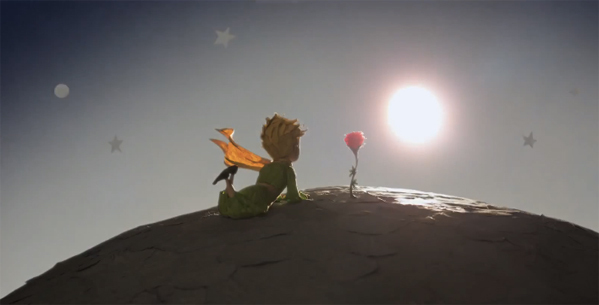 You can still watch the first teaser trailer for The Little Prince right here. The Little Prince is directed by Mark Osborne (Kung Fu Panda) and written by Irena Brignull (The Boxtrolls). Based on the novella of the most famous work of the French aristocrat, writer, poet and pioneering aviator Antoine de Saint-Exupéry, the story unfolds as a pilot stranded in the desert awakens one morning to see, standing before him, a most extraordinary little fellow, who teaches him the secret of what is really important in life. The English version of the film features the voices of Rachel McAdams, Mackenzie Foy and Jeff Bridges and arrives sometime in 2015, but no word on seeing the French version in the US.